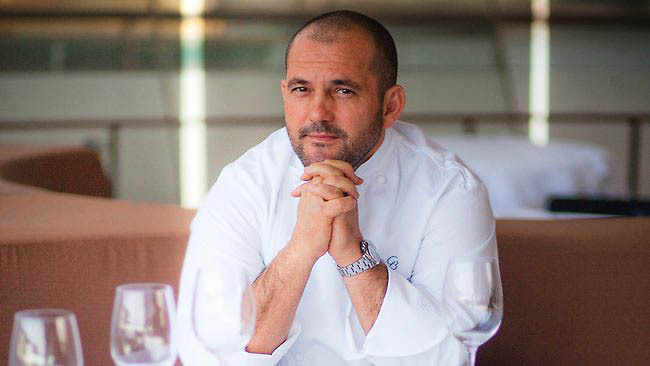 Guillaume Brahimi is now adding 'in-room' menus to his repertoire, at Melbourne's Crown Towers. There’s no denying we’re a nation of foodies – a fact any savvy hotelier knows only too well. No surprises then that Melbourne’s Crown Towers, one of the savviest of all, has upped the culinary ante with a very welcome food initiative: a new in-room menu designed by not one, but two celebrity chefs – Guillaume Brahimi and Neil Perry. Crown isn’t the only hotel polishing their silver service – Sydney’s Shangri-La has also cooked up a new initiative in the hopes of getting our attention, with a concept they’ve coined the ‘Chefs’ Surprise’. Book in for the 10-course degustation – if you can, it reputedly sells out fast – and you’ll receive 10 dishes, each created by a different chef. Risky? Perhaps. But decadence sells. Just like Adriano Zumbo’s ‘dessert train’, now found in Sydney’s luxury casino and hotel complex, The Star – designed in case you can’t stop at one world-class dessert… hey, we’d like to try a little of them all, too. Gold Coast’s Palazzo Versace is now also offering cooking master classes, where you can learn inside trade secrets to sufficiently leave dinner guests in awe of your cooking skills. MORE: Tasty new morsels for the foodies.